With just a few ingredients look how amazing you can make a simple salad in just minutes! It is also a great way to discuss with your children the creativity of nature. The star fruit before it is cut looks uninviting, but when thinly sliced they look like stars! The skin on the star fruit is so thin that there is no need to peel. Ingredient amounts makes 4 large salads or 8 small dinner salads. Rinse and drain mixed greens. Make sure greens are dry or the dressing will not stick to the greens. 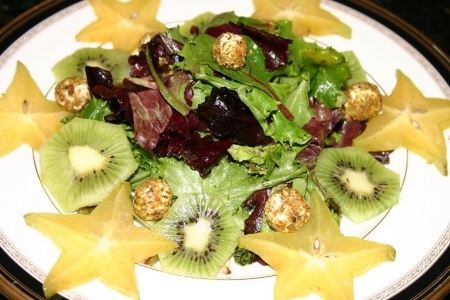 Thinly slice kiwi’s and star fruit and set aside. In a small skillet over medium high heat, toast finely chopped pistachios. Once toasted place onto a small plate. Take a small amount of the goat cheese and form into a raspberry sized balls. Roll all of the goat cheese balls into the toasted pistachios and set aside. Place equal mounts of ingredients on each plate. And arrange in the pattern as shown above. Drizzle with vinaigrette right before serving, or let your guests drizzle their desired amount. Alternatively place plates in the fridge to chill, toss greens in a large bowl with dressing and divide among chilled plates, add remaining ingredients and serve.